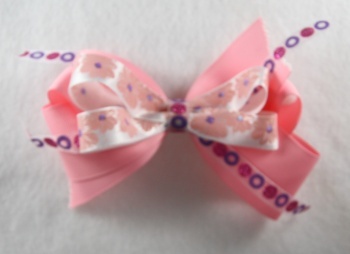 Light Pink, Purple, and Hot pink sparkles makes this a great mixture for a bow. The base bow is a light pink grosgrain ribbon that is topped with a sheer sparkling ribbon with hot pink and purple circles. Then a topper bow that is a white 5/8" satin ribbon with light pink flowers that has a sparkling purple center. The center is wrapped with the same circle sheer ribbon.